Having a home garden is really an awesome thing. The only drawback is when everything is ready to harvest at the same time. 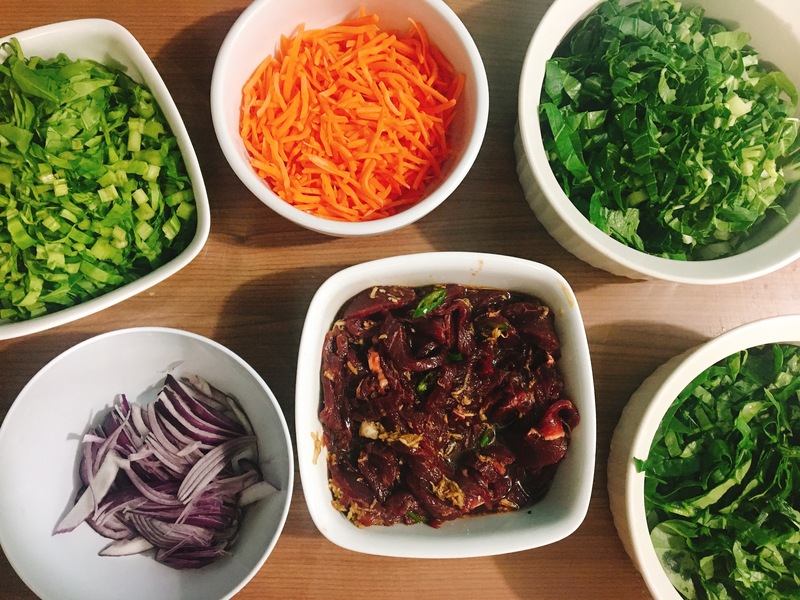 I kept on debating what to do with all the greens that we had and finally it dawned on me, why not make a Korean Inspired beef bowl. 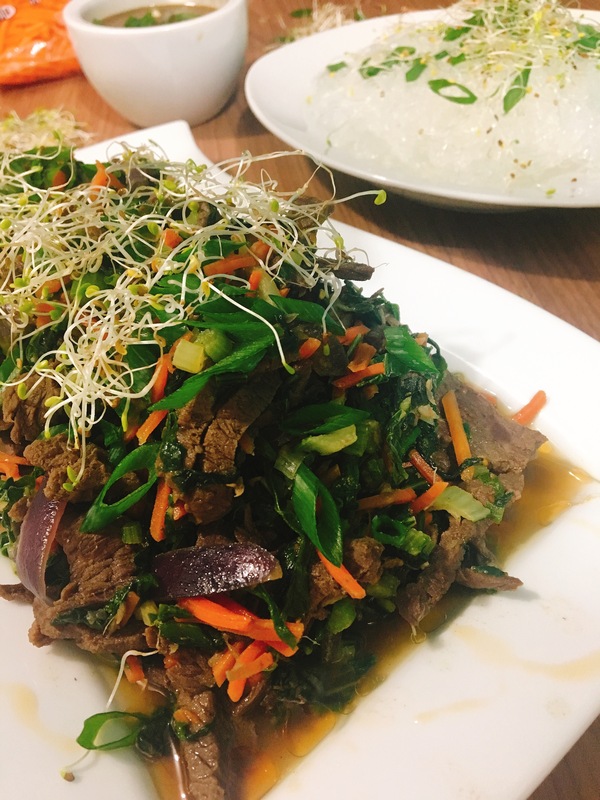 Traditionally it’s made with beef alone, but for this recipe I added all the greens and made it a one pot dish, served with rice noodles. Prepare your beef by slicing it thinly for quick cooking. Next in a bowl make a marinade with the cayenne pepper, sesame oil, soy sauce, ginger, garlic, salt and honey. Add to sliced beef and let it marinate for at least 20 minutes. 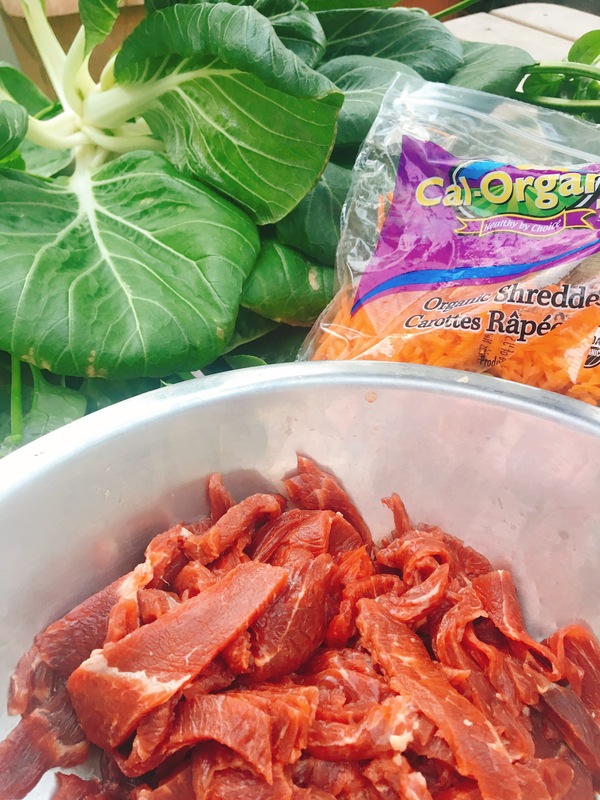 While the beef is marinating, prepare the rest of veggies by cutting them thinly for easy cooking. Heat a wok until smoking, add 1 tsp sesame oil, then add beef and cook for 5-7 mins (depending on how thin your beef is sliced), making sure to stir periodically. Next add onions and carrots and cook for another 3 mins. Finally add all the greens (the wok may look likes it’s overflowing but it will wilt down) and stir, cooking the greens for another five minutes until the greens are cooked. Finally season with salt to taste and a little more soy sauce. Finish by garnishing with sliced green onions and a dash of Toasted Sesame oil. Serve with rice or rice noodles and enjoy!!!! Just for some extra crunch I topped mine with spouts! !